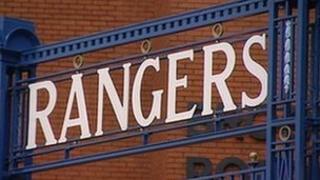 Rangers' administrators estimate that the club's total debts could top £134m. The figure is revealed in anadministrators' report to creditors published on the club's website. A total of more than £93m is being claimed by HM Revenue and Customs, relating to the so-called big and small tax cases, and unpaid VAT and PAYE. The report also reveals Rangers owe cash to other football clubs including Celtic, Hearts, Dundee United, Manchester City and Arsenal. The full extent of the potential liabilities facing Rangers has been unclear since the Ibrox club went into administration in February. Administrators Duff and Phelps, who have been tasked with rescuing the financially stricken club, have said they are considering three takeover bids out of the four that were submitted on Wednesday, and hope to accept one by next week. The three bidders are understood to include former Rangers director Paul Murray's Blue Knights consortium, along with bidders from Singapore and the US. The creditors' report reveals, however, that the club owes cash to 276 individuals, businesses and public bodies. The largest estimated combined amount, more than £93m, is to HM Revenue and Customs (HMRC). Currently, the largest established unsecured creditor is private finance firm Ticketus, which is owed £26.7m. And taxpayer-funded bodies also owed money include: Strathclyde Police (£51,882), Scottish Ambulance Service (£8,438), Culture and Sport Glasgow (£10,338), Glasgow City Council (£7,000), Argyll and Bute Council (£406), and Edinburgh City Council (£90). The report also reveals that Rangers owe more than £2.3m to 12 football clubs in Scotland, England and throughout Europe. Domestically, Rangers owe: Hearts (£800,000), Dunfermline Athletic (£83,370), Dundee United (£65,981), Celtic (£40,337) and Inverness Caledonian Thistle (£39,805). English clubs are also owed more than £700,000. This breaks down as: Manchester City (£328,248), Chelsea (£238,345) and Arsenal (£136,560). European clubs are also owed more than £1.6m, including Rapid Vienna (£1,011,763), St Etienne (£252,212), Palermo (£205,513) and Orebro (£150,000). The report reveals that since Rangers went into administration - some six weeks ago - the club has lost more than £2.5m. The £134m potential debt figure revealed in the Duff and Phelps report does not include liabilities to employees, including the playing staff whose contracts revert to their original terms on 1 June. If these playing staff contracts are to be honoured, the potential £134m liability will rise by a further significant amount. BBC Scotland football reporter Alasdair Lamont said the potential debt would be a lot for any buyer of the club to take on. But he added: "These figures will have been known to all the parties who have indicated any interest at all in taking over Rangers. "None of these figures are surprising, it is just when you add them all together it seems incredibly large, and probably why in recent days this idea of liquidation has become more and more of a possibility you would have to say. "The administrators are making the point today (Thursday) that having got four bids in yesterday they are more confident again they will be able to come out of administration through a CVA and avoid this liquidation."